An escape to an idyllic Irish seaside village is about to turn deadly in this riveting new novel by master of romantic suspense Carla Neggers. For marine biologist Julianne Maroney, two weeks in tiny Declan's Cross on the south Irish coast is a chance to heal her broken heart. She doesn't expect to attract the attention of FBI agents Emma Sharpe and Colin Donovan, who are in Ireland for their own personal retreat. Ten years ago, art was stolen from a mansion in Declan's Cross, but it has never been recovered and the elusive thief never caught. Now, from the moment Julianne sets foot on Irish soil, everything goes wrong. The well-connected American diver who invited her to Ireland has disappeared. And now Emma and Colin are asking questions. 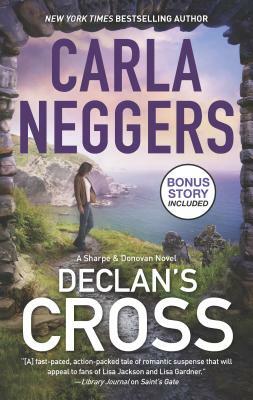 As a dark conspiracy unfolds amid the breathtaking scenery of Declan's Cross, the race is on to stop a ruthless killer...and the stakes have never been more personal for Emma and Colin. Includes the bonus story Rock Pointwww.CarlaNeggers.com.